Source of title proper: Title based on creator. 3.7 m textual records. – 3956 photographs. Fort Edmonton Park was approved in principle by City Council in 1966. In 1967 Fort Edmonton Park was under the auspices of the Parks and Recreation Department’s Historical Division. In order to develop as authentic an experience as possible, the creation of Fort Edmonton Park generated an extraordinary amount of research concerning Edmonton’s past. The Fort officially opened in 1974, and expanded over the next decades. Fort Edmonton Park is owned by the City of Edmonton. They are supported by the Fort Edmonton Historical Foundation, a charitable organization established in 1969 to promote the creation and development of the park; to assist in the preservation of buildings, artifacts, and records; to establish and maintain a fund to do this work, including taking donations; and to apply the capital and income of the funds for this purpose. In 2009, City Council approved the creation of the Fort Edmonton Management Company, to operate and manage the Park. Responsibilities of the Company include the development of all capital projects subject to the approval of City Council. 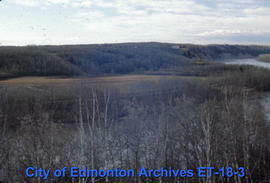 The photographic slides that comprise ET-18 are believed to have been taken to document Fort Edmonton Park and John Walter Museum. At some point they were sent to the Parks and Recreation Department library, which in turn transferred them to the City of Edmonton Archives. This subseries contains records created in the planning and operation of Fort Edmonton Park. The material includes research, reports, proposals, and planning documents. The sub-series also includes photographs taken of Fort Edmonton Park, John Walter Museum, the Historical Exhibits Building, the Cromdale Warehouse (former Cromdale Bus Barns), the Nature Centre, the C.W. Cross Residence at 12729 Stony Plain Road, the McCauley House at 10042 92 Street, general shots of Riverdale and the Edmonton skyline, and an interior photo of the Ukrainian Bookstore. This material was transferred to the City of Edmonton Archives between 1975 and 2016. The material was arranged by the archivist by type of record (research, reports, proposals, and planning documents). The photographs were arranged by subject and assigned item numbers with the prefix EA-263 and ET-18. The transcriptions of the Edmonton Post Journal (files 178-267) made ca. 1970 have restrictions. No copies can be made. The originals are located at the Hudson’s Bay Company Archives in Winnipeg, Manitoba. Photographs have been described at the item level; some are available on the online database, with the remainder available in the Reference Room.